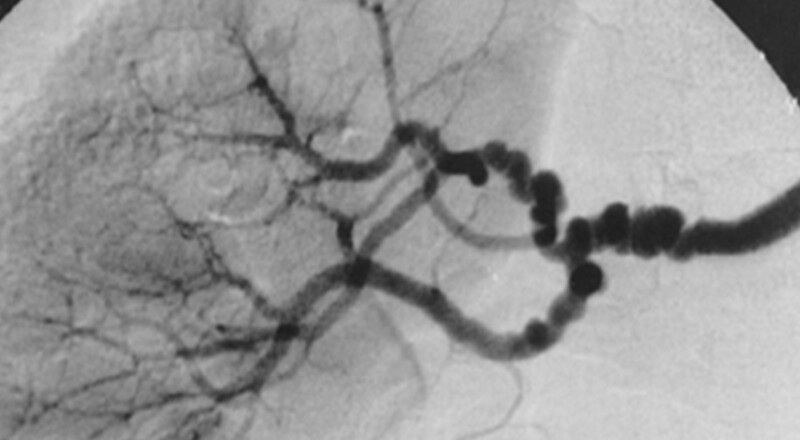 Fibromuscular dysplasia (FMD) is an idiopathic disease of small- and medium-calibre arteries. The disease can affect all the layers of the artery causing an angiopathy. It tends to affect the distal extracranial portion of the carotid artery. Commoner in young and middle aged females. Female > male incidence is about 3:1. Has been found in 1% of carotid arteries at post mortem. Causes both stenosis and/or dilation of blood vessels. Consider diagnosis in young patients with ischaemic stroke or with saccular aneurysms +/- SAH. Medial fibroplasia (80%): Commonest form. Classical beading appeanace on angiogrpahy. The multiple stenotic “webs” cause arterial stenosis and poststenotic dilation. Aneurysms are often seen. Medial hyperplasia (<1%): Pathologic diagnosis. Adventitial fibroplasia (< 5%)Can be diagnsoed using intravascular ultrasound (IVUS) imaging. Angiography resembles intimal disease. Post mortem: vascular histology shows increased collagen within the intima and media. The media may be thinned and there may be beading. As per normal Ischaemic stroke. Manage dissection usually with antiplatelets short/long term. Intervention for Renal artery stenosis may be useful. Fibromuscular dysplasia: what the radiologist should know: a pictorial review. Insights Imaging. 2015 Jun; 6(3): 295-307.